Importing your Products into Vend using a CSV file – How can we help? CSVs are often used to bulk import and edit products in Vend. We've made some improvements to make this process even faster and easier to use. SKUs and Handles will now automatically populate if you do not include these as columns in your CSV. The name field is now the only mandatory field required to import your standard products, unless you are working with variant or composite products. If you are working with variant products, both the Handle & SKU are required. You can now use a column matcher, when importing your product CSV, to fix any columns that are incorrectly named. When you choose to import or update products using a CSV, your CSV will be put through our system so that Vend can run a quick check on your CSV file. It will check for any formatting issues or errors such as column headings and mandatory fields and let you know if any of these errors are present in your CSV file. 1. Either drag and drop your CSV file or click browse to search for and add the CSV file. 3. At this stage, you'll be able to view any unmatched columns and fix them by selecting the correct column from the drop-down menu. You'll also have the option to change the matching of any other columns or choose not to import a specific column. 4. Once you've matched all the columns correctly, click continue. If there are no further column errors during this step move straight onto step 6. 5. If any mandatory columns are missing from your CSV an error screen will appear. From here, you'll be able to view the missing column(s) and download a new version of your CSV to make sure the missing columns are added. Once you've made the required changes, reimport your CSV file by either dragging and dropping it into the Vend window or starting again from step 1. 6. Once successful, you will be taken to a confirmation screen. From here, click 'continue import' to import the products into your store. You may also receive warnings before importing. 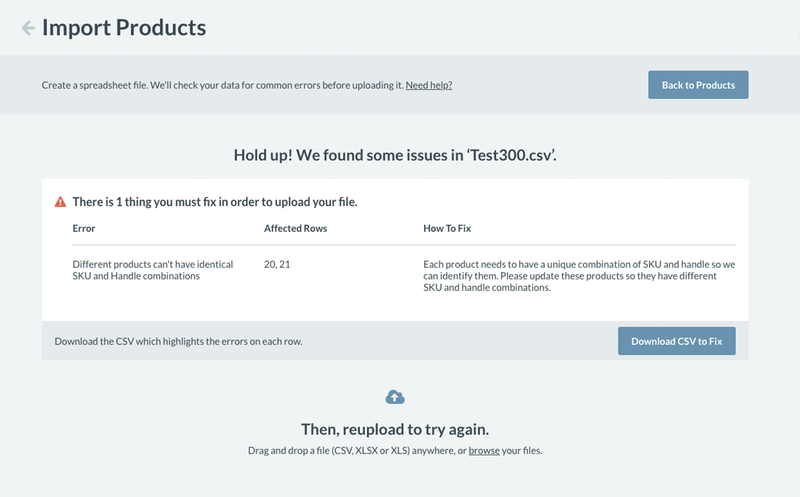 If your CSV contains duplicate SKU's for example, you may receive a warning message. If you receive a warning message you can still proceed with the import but we recommend you make a note of the warnings you receive and fix them if necessary. If you see the screen below, the contents of the file you have tried to import may not be separated correctly. The best way to fix this up is to run through the steps for creating your CSV using our premade template. To find these steps, click here. If you're still unable to upload the file correctly, get in touch with us here. If you see the screen below, the file type you have tried to import may either by incorrect or corrupt. Double check that this file is a .csv file and reimport it.